The classical warrior trained out of dire necessity and for the purpose of survival. The advent of modern martial arts, however, have created a new paradigm: the martial hobbyist. Is the study of the martial ways still worthy of a lifelong pursuit, or has commercialism relegated them to just being another pastime? Can your bi-weekly karate class be put on a par with bowling, tennis or some similar recreation? Classical budo is not a trifling matter begun for fun or whim. And it is not to be engaged in for personal pleasure or social amusement. Those who would seek to use the dojo for refined exhibitionism, peacock pride, social climbing, chitchat, or gossip have failed to grasp the fact that the profundity of the classical budo exceeds love of self. Now that's serious. Ironically in his personal life, Draeger had a reputation for being a prankster and a hell-raiser, but I digress. I don't mean to mock this way of thinking, rather my point is that I feel it is up to the student how to approach training in the martial arts. Depending on the person, like it or not, there will be those who regard the dojo as either a temple, a school, or a hangout. It's their personal business; just train hard and go about your own business. Even for those who aspire to black belt or teach, very few are cut out for the dedicated long haul. I am reminded of a story I read recently, that was written by a practicioner of a koryu martial art. He had a very senior member of his ryu in to do a seminar. A young man at the seminar, a mixed martial arts practitioner, respectfully asked if after the seminar, and everyone left, that he could 'have a go' at the senior. So the seminar ran, and people left. The senior went over to fiddle with his gym bag while the younger man prepared himself. Ok, it was time. They faced off. The young man shot in low, and took the older man down, then proceeded to put him in a submission hold. But something went wrong. The younger man started turning blue. He passed out. The senior had fashioned a garrot out of his shoelaces and was strangling the younger man with it. As he brought the young man back to consiousness, the older man explained: "to you this is a sport; to me, this is a matter of life and death." Good post and I like the story the commentor Rick posed as well. It is very difficult to run a dojo with just dedicated martial practitioners unless you run it as a back yard dojo. No money, no sport karate, just the martial way and if you are lucky you will have maybe two dedicated practitioners. This is why I attend anothers dojo to practice. I do what I want to practice and learn while observing the class. It is a good class yet it is not really sport nor is it really martial. The CI has found a spot that is kinda in between with it closer to sport and is happy. The good thing is he has run this club for six years and has about eight or ten regulars. Even tho they do not practice that much out side of the dojo and don't attend every class it is good. "just train hard and go about your own business. " I agree with Mat... "Just training"
Having said that, I've seen fitness centres offer karate courses as a packaged product run by people who are not martial artists, but are gym owners looking to fill their schedules. I've always considered myself very fortunate to have the experience of training in a dojo run by two police officers, one a SWAT officer. They enjoyed karate, no question, and we always had fun. We even did well in tournaments. However, every day, in everything they taught us, it was always abundantly clear that this stuff mattered. Forms were regularly intersperced with gun and knife classes, fighting in the dark, fighting multiple attackers, anything and everything they could think of to prepare us for a true life-or-death fight. It was an eye-opening experience, and one I will always value. Again you are the master of concise posts! Most excellent. I'm working on a two-part post on this very topic when I read yours! Martial arts mind-meld? I agree with Matt....train hard and go about your business. At our school we can train seriously and put a lot of hard work in but it can still be fun too. Social and chatty but with hard work. Good anecdote. Thanks for sharing that story here, Rick. I've seen those pseudo-samurai types myself. Unfortunately, there's no shortage of frauds in the martial arts. Cops that teach the martial arts usually bring an element of reality into their training, obviously because of the nature of their work. Thanks Bob. I'll check out that post when I get a chance. And why not? That was the crux of my article: train hard, have fun. That's it! I think that it is difficult to call ourselves anything but "hobbyists" if we cannot dedicate our whole day to training the way that the classical warriors had to train. In history, these warriors would wake up, train, eat, train, go to sleep, and then do it again the next day. I've heard of some karate students who have achieved something similar by training the way that Olympic athletes train, or a military soldier... but I would like to say that the majority of Martial artists today can only dedicate a select number of hours per week to their art. There are so many demands such as work, family, church, etc. that call upon our available hours. I may be wrong but I think that people consider 15 - 20 hours a week alot of training... (2-3 hours a day) Is it not? I would like to suggest that this amount of time is still in the hobbyist level. BUT our attitude in our training can be "serious business" .. we can treat our art with the right perspective regardless to how many hours we chose to train. Solid comment! Everyone would do well to read it twice. I not only agree with everything you said, but I couldn't have said it better. Thanks for your input, Mireille. Our lives are far from depending on our training. Not in the classical sense, anyways. Ha, if one day I can turn that hobby into a way of living, it'll be great! I would agree with many other comments here: for the most part, we are all likely hobbyists--not true martial artists. One point my sensei makes is this: in most cases, there is little or no need for us to know how to fight. Few people get into fights anymore, unless they live in rough neighborhoods or are particularly antagonistic. Most people train because they want to feel that they could handle themselves--or at least handle themselves better--if they came under physical attack. Yet the odds of this occurring are usually quite small. Does this mean training for self-defense isn't important or necessary? Not at all. But our goal must change. Rather than the goal be to win a fight, the goal should be to improve oneself. I am only on the mat a few hours a week. But I like to think that I carry my dojo with me wherever I go. I am always thinking of how to apply what I've learned in a variety of situations; from dealing with an upset coworker, to staying calm in rush hour traffic with an irate 3-year-old, to defending myself physically against someone who's had way too much to drink. Training is a path. Whether you choose to walk that path off the mat is up to you. If there is any effect that martial arts training will one day be clearly proven to have on the human mind, it is that of instilling in us a predilection for all-or-nothing thinking. Draeger's writings are sometimes quite extreme and romantic, as are some others who write on the topic of martial arts, as if study of a fighting system is some black & white issue. Either I am a samurai warrior or I am the dirty, unworthy commercial consumer who can't do three pushups and who cries for mommy when violence breaks out. Both of these are extreme perceptions presented by extreme minds. Maturity hopefully resolves extremism in the human mind, as experience teaches us that issues we thought were cut and dry are actually more complicated than we originally thought. Black and white thinking is for kids... and apparently it is also for martial artists who are adults. 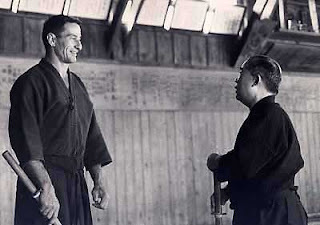 To Draeger, I would have put forth the challenge for him to show me the lack of seriousness in my training over these decades as I worked on kata after kata and even threw my life away to travel to Japans specifically to do Karate. Yet, Karate is my hobby, not my lifestyle, and I participate in it for less than noble reasons and always have. These days, I view it as portable, not-so-boring aerobics which is less embarrassing to be seen doing than Jane Fonda's workout. But I am still very serious about what I do. Or am I? Maybe I don't have to choose between those two extremes. Maybe I am just kind of serious. How much serious is enough for someone who is an extremist? How much is enough for a balanced individual who, instead of swallowing martial arts myths whole, is honestly working on improving his own character flaws by pursuing moderation, not extremism, as a lifestyle? Nice article. I love Draeger, always have. But even though he had a broad variety of experience in Chinese and Indonesian arts, he trained in Japanese arts and he wrote with Japanese arts in mind. If you look back to the old Hoplos articles and his other writings, his arguments make perfect sense within the Japanese framework, but don't necessarily apply across cultures (think of his civilian/martial classification system for example). Many cultures have used play, sport, and even dance as the basis for instilling martial movement. It would be hard to categorize them as "serious business" the way Draeger uses the term and I don't think that lessens their value. In fact, in history overall, I would argue that a dedicated professional fighting class is probably no more common than the citizen soldier who trains only part-time or in times of need.